Well folks, I can finally say my experience with FUNARTE— an organization known for its collective public art— is complete! 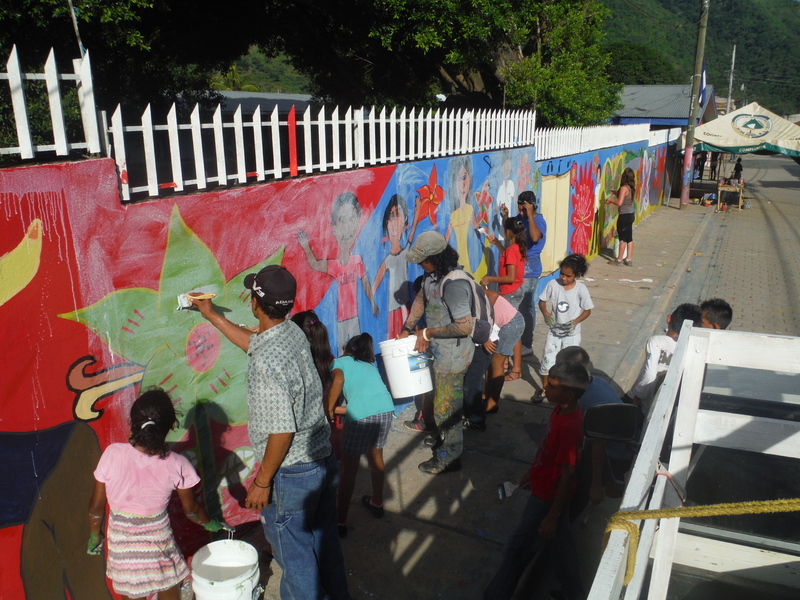 I just got back from a week of helping to paint a 110 meter Children’s Participation mural in Quilalí with 9 other facilitators and more than 100 girls and boys from the neighboring community of Panalí. 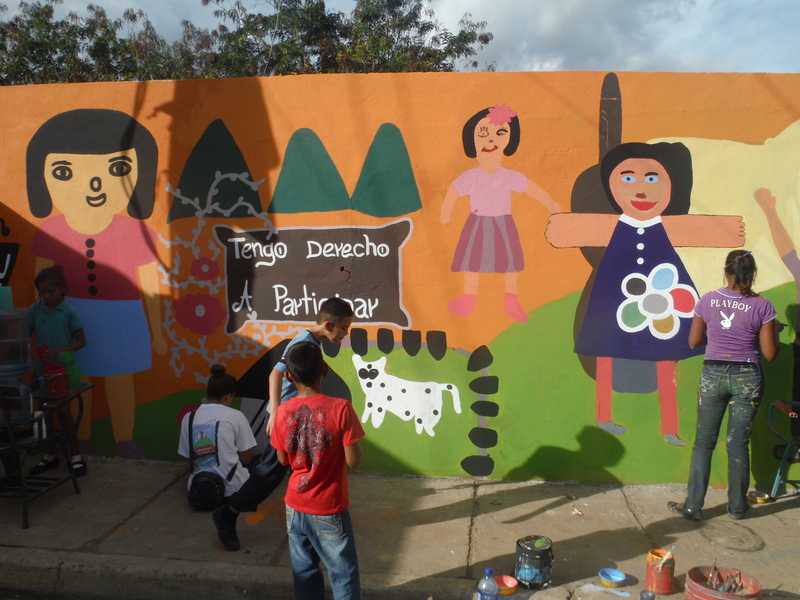 The mural was an ambitious project that, to be honest, I had doubts we would ever finish in five days, but I was continually blown away by the enthusiasm and energy the kids put towards the project and in the end we were successful in accomplishing one of the longest murals FUNARTE has ever facilitated. In this post I want to share a couple of the lessons I have learned from working with the kids on the mural and from my experiences with the rest of the Colour of Affection project over the past 5 months. 2/3s of the 110m wall before the mural. Working with the kids on the mural. 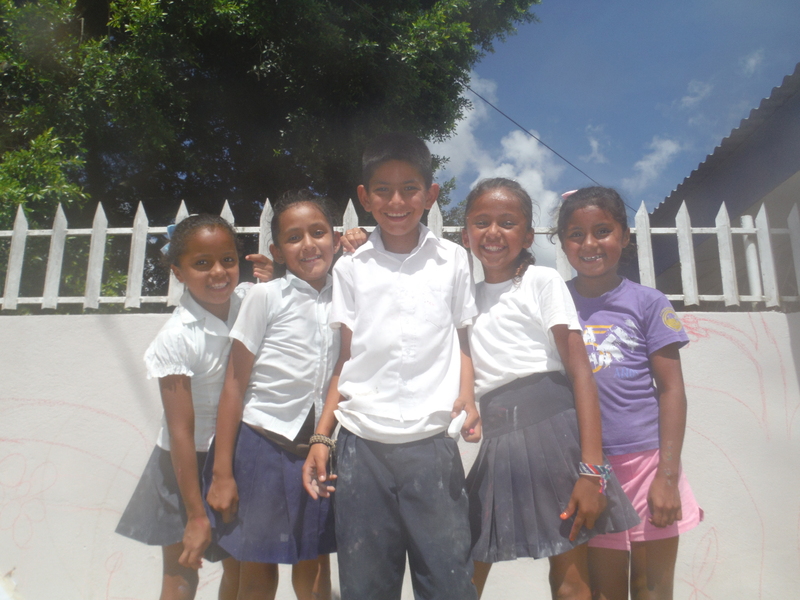 Working with children has been one of the greatest pleasures of my time here in Nicaragua. I have always loved working with kids because of their energy, enthusiasm, outlook, penchant for learning, and because of what I learn from them. In formal educational settings there is often the assumption that the teacher is the one who teaches and the children are the ones who learn. 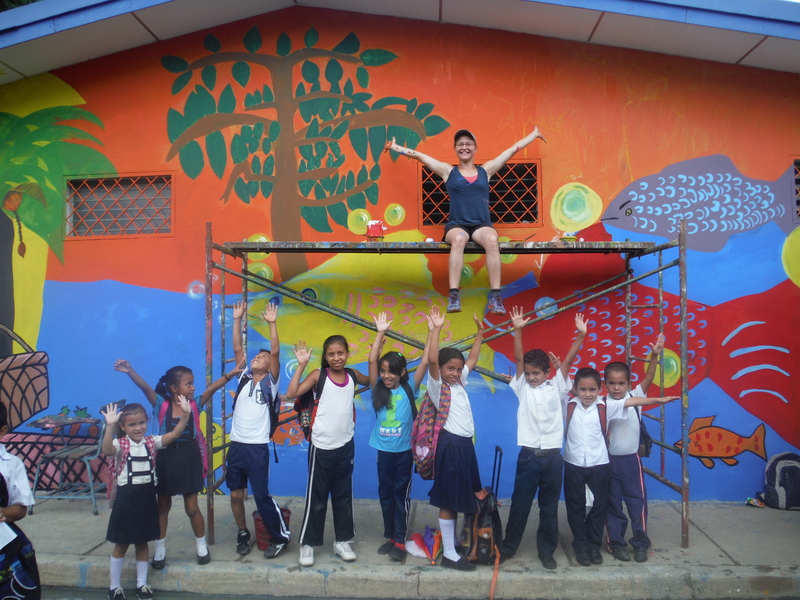 But my experience painting the mural and working with FUNARTE has strengthened my conviction that children teach us so much more than we can teach them. They teach us openness, curiosity, honesty, and non-judgement. They teach us to seek genuine connections with one another and to relish in simple joys. They teach us to challenge ourselves to grow while caring for those who need support. In short, they teach us to be better people because they show us our true nature as human beings— as learning beings. 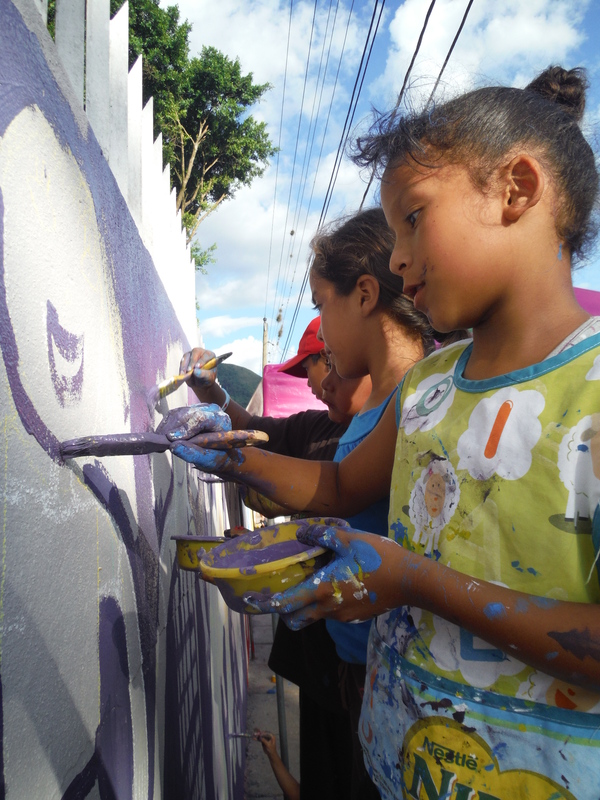 Painting the mural was also a powerful lesson in collective action and cooperative development. Imagine the challenge of bringing together more than 100 different artistic styles, ability levels and ideas about the end product to create one masterpiece of images, messages and colors that do everyone’s ideas justice. This is no simple task, yet through constant communication, teamwork, problem solving, mutual support and encouragement we were able to accomplish something more beautiful and bold than any one person could ever achieve alone. 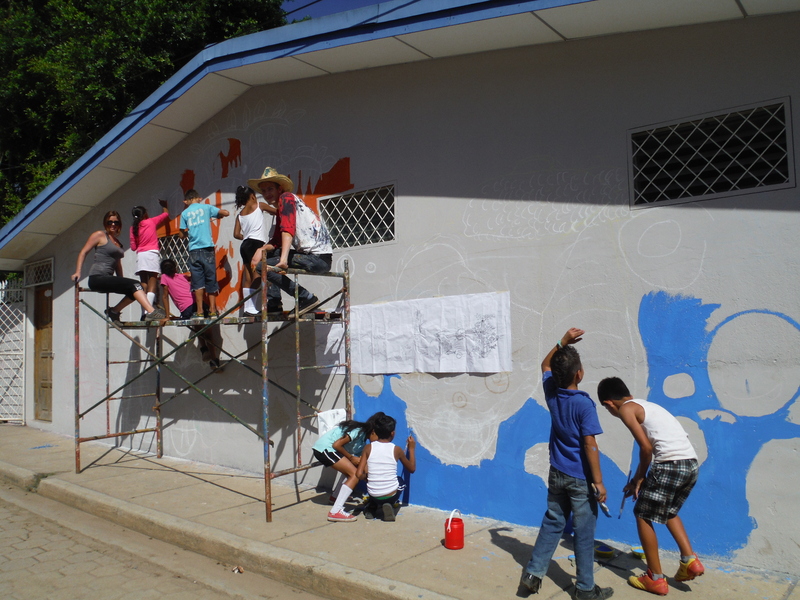 The mural was the talk of the town for the entire week with the local news covering the process from Monday to Friday and with many people taking time out of their days to pass by the school where the kids were painting. 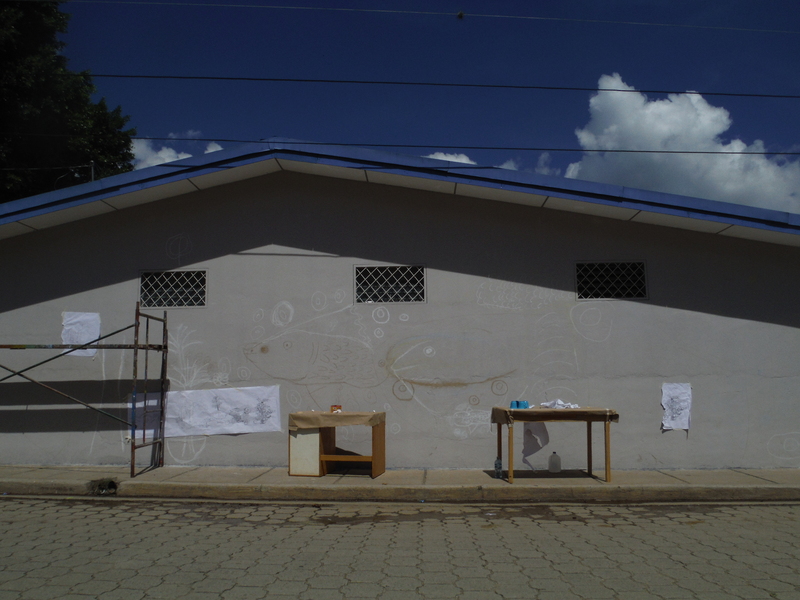 In conversations with adults in Quilalí I found out that many people were skeptical at first that a group of ten-year-olds could create an aesthetically satisfying work of art (let alone the masterpiece it was! ), yet by the end of the week we were hearing nothing but compliments and praise from passersby. Working on the library part of the mural with the kids. The library of the school before the mural. The library part of the mural complete! 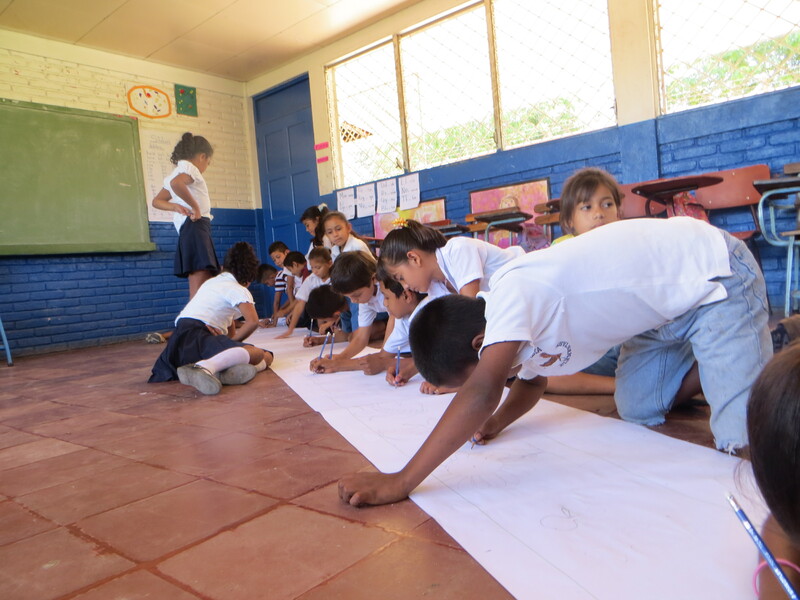 FUNARTE’s mission as an organization is to positively influence the sociocultural valuation of children and adolescents as agents of change and transformers of themselves and their environment. 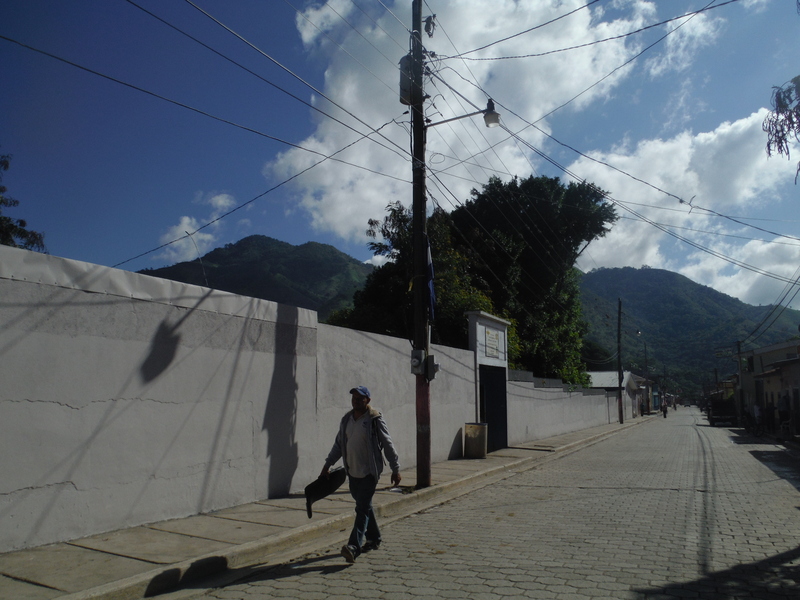 This mission gets to the root of a lot of social issues that involve children in Nicaragua and elsewhere: they are simply not valued as full human beings with rights and autonomy and therefore they suffer abuses on the part of adults such as paternal abandonment, forced labor, corporal punishment, and early marriage and pregnancy, among other exploitations that stifle their potential, which in the end, stifles the potential of an entire society. We need to value the contributions that children make to society more and give them a platform to lead and express themselves. For FUNARTE, art is that platform and I have seen time and time again in the art workshops, reflection sessions, mural painting, community development projects and national events that FUNARTE facilitates that kids are keen to express their dreams, feelings, and thoughts and they are keen to be a part of making the world a better and more beautiful place. 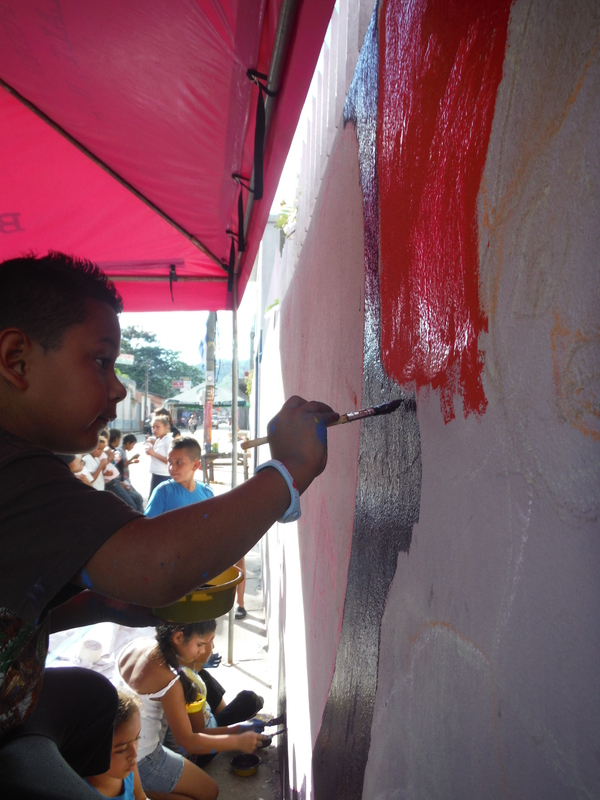 For example, at each step of the process of putting the Quilalí mural together the kids were in the lead: they developed the concept of participation (building upon the themes of the artistic reflection sessions we had been facilitating with them), they designed the content of the mural and they painted the large majority of the mural with us facilitators simply providing guidance and oversight. Kids working on the mural together. 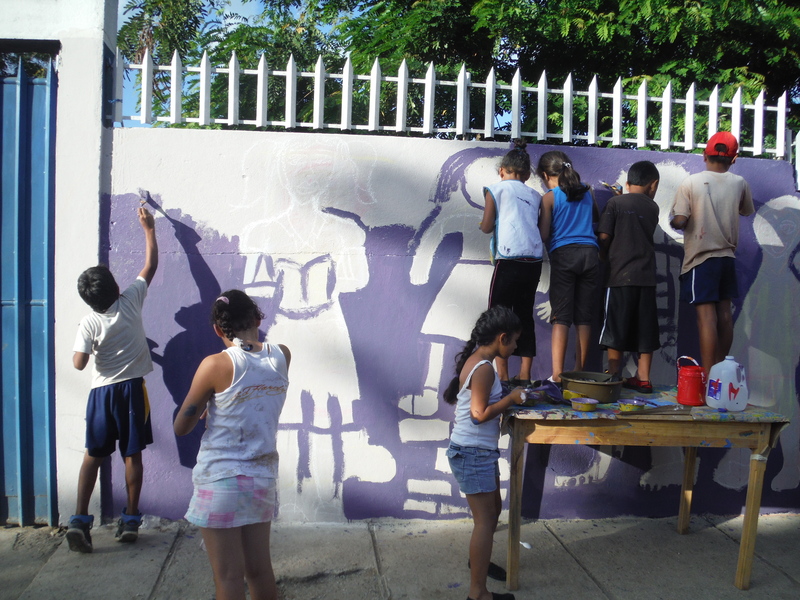 Panali girls and boys designing the mural. This example shows that when a young girl or boy is armed with information, resources, support, and the opportunity for genuine participation they take it. It is our responsibility as adults to provide those resources, be those supports and give those opportunities. Children are not the future; they are an essential part of the present and it is time we acknowledge what they teach us and what they contribute to our society today and into tomorrow. If there was a love button, I would love love this post!! So inspiring to see the children, once again, be the leaders of such incredible work. Sasha, this is really well done, as usual. Your writing skills allows me to feel like I’m right there experiencing it for myself. Thanks so much for that!